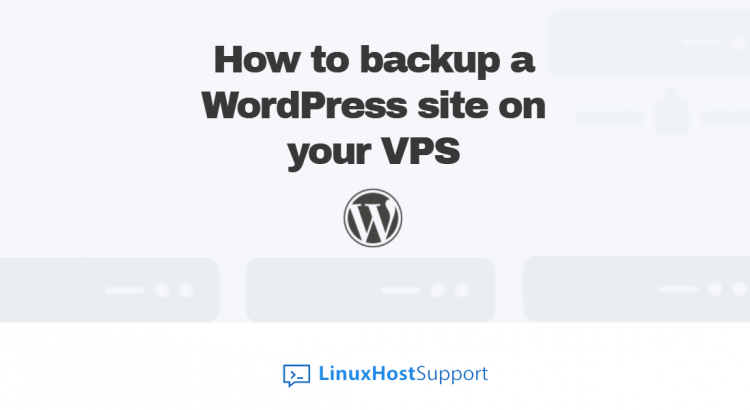 In this tutorial, we will show you how to manually backup your WordPress site on your VPS. It is highly recommended that you make regular backups of your WordPress site so you can easily restore it if something unexpected happens, for example, if your site breaks because of a faulty plugin, it gets infected with malicious files, you accidentally delete the contents of our database and so on. In order to fully make a backup of your WordPress site, we will need to to make a backup of your WordPress files and your WordPress database. First, we will make a backup of all of your WordPress site files. To do so, you need to log in to your VPS via SSH. All of these together will generate your WordPress site, so it would be best to backup all of these files and directories. It is usually enough to only copy your wp-content directory, as the contents of wp-admin and wp-includes are usually never modified, and you can always retrieve them from the original WordPress installer. But, just so you can have a full working copy of our site, it would be a good idea to make a backup of all the WordPress files together. This will create an archive file of all the WordPress files which generate your website. Your WordPress files alone are not enough if we want a complete backup of your website. All the information of your website, including your posts, comments, site configurations, user accounts and so on, is stored in your database. If you are not sure of the user, database name and password, you can find that information in the wp-config.php file inside your WordPress directory. Of course, if you are one of our Linux Host Support customers, you don’t have to do any of this, simply ask our admins, sit back and relax. Our admins will make a backup of your WordPress site for you immediately. PS. If you liked this post, on How to install Monica on Ubuntu 16.04, please share it with your friends on the social networks using the buttons below or simply leave a comment in the comments section. Thanks. Thanks for your guidance. It is helpful.